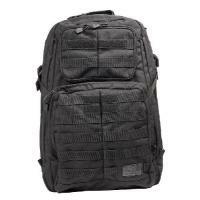 511 Tactical RUSH 24 Backpack (58601) FREE SHIPPING! The VTAC RUSH72 and RUSH24 backpacks were designed by Kyle Lamb, a guy who has certainly tread his share of miles with loads of gear. Ruggedly constructed from water-resistant, 1,050-denier nylon, these molle backpacks feature flexible main storage compartments with internal dividers and compression straps. Side pockets and front organizer compartments are common to both backpacks. Other common features include hydration pockets, eyewear pockets, sternum straps and YKK® zippers throughout. Good pack, well built. Many pockets and sections for the little odds and ends. Good Molle strap coverage and roomy main compartment. Makes for a great day bag. Denny Hansen reviews the 511 Tactical RUSH 24 backpack. Ruggedly constructed from water-resistant, 1,050-denier nylon, these molle backpacks feature flexible main storage compartments with internal dividers and compression straps. Side pockets and front organizer compartments are common to both backpacks. ©2002-2019 CopsPlus.com: 511 Tactical RUSH 24 Backpack (58601) FREE SHIPPING!